Regardless of your political affiliation, having the chance to see the President of the Unites States in real life is a once in a lifetime opportunity. One such opportunity I was beyond excited to get to experience last Monday. 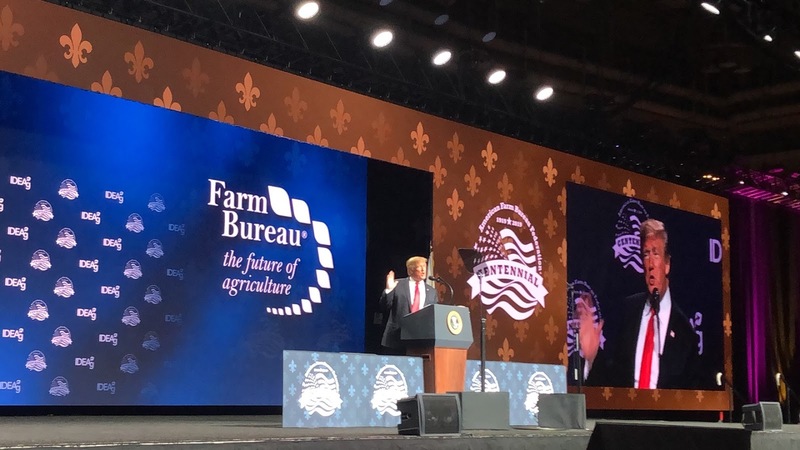 We found out the Wednesday before that President Donald Trump would be the closing session speaker for the American Farm Bureau Meeting. This year marked the 100th Anniversary of the American Farm Bureau Federation. I was already set to travel to New Orleans for the Annual Meeting as the past chair of California Young Farmers and Ranchers. As I was packing for the trip, I got a text from a friend telling me to check my newsfeed and sure enough it was announced that Trump would be addressing the delegation on Monday morning. So with my bags packed, excitement in my stomach and much anticipation I made my way to New Orleans to join farmers from across the nation. I got up extra early that Monday morning to get in line and be one of the first 50 or so to go through security and be welcomed by secret service. 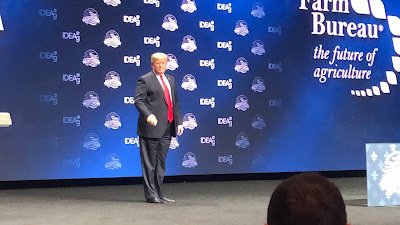 I made my way into the convention center and found front row seats where I would make myself comfortable for the next 5 hours until Trump came. It is crazy to look back at it now, I literally sat in a convention center hall with thousands of other people for 5 hours, just waiting for the President to come speak to us. 5 hours, half the work day. 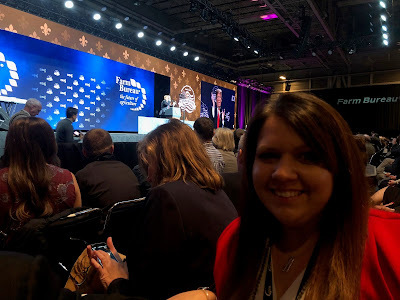 We got up, waited in line and were seated in the convention center seats before the President even left Washington D.C. that morning to come speak to us! But it was the President of the United States of America. After waiting so long, I had to take a Trump selfie! After much anticipation, he was finally here. Secretary of Agriculture, Sonny Perdue made his way to the stage for brief remarks and to introduce the President. 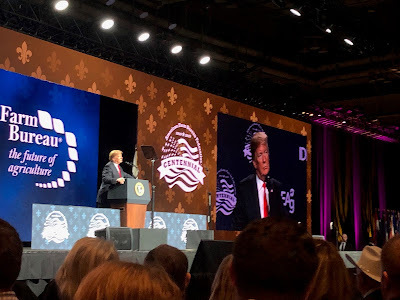 Soon enough it was time, President Donald Trump was addressing American farmers at the AFBF meeting. 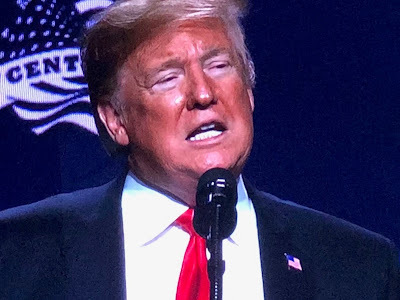 Most of his hour speech was him discussing the border wall and immigration. It is a hot topic right now with the government shutdown. It wasn’t a surprise, but we were pleased he addressed the topic as it affects many in the agriculture community. He even brought forward an Arizona farmer to discuss the devastation the illegal immigrants and drug trafficking is causing on his farm. Urging the President to build a wall to put an end to the corruption and ruthlessness that is crossing the border and causing damage to private property and people’s lives. Trump assured the American farmers he is looking to make our agriculture industry stronger, better and brighter through proper trade deals that will enhance our industry. For years, trade with foreign countries have been detrimental to our economy and unfair. With trade that is balanced and fair our industry will thrive and grow. He spoke of China’s unfair trade and the forming of the US, Mexico and Canada Agreement. The President addressed the tax cuts he enabled to aid in farms being transferred to successive generations. He spoke on the Waters of the US rule that he helped to fix after the Obama administration tried to unnecessarily control drainage ditches, puddles, and private ponds. He left the farmers in the room knowing the importance he has on agriculture. He supports us and wants the agriculture industry to thrive. The fact that he came to address American farmers for the second year in a row, when the last President to come was George HW Bush, shows the magnitude of appreciation he has for the agriculture industry. If you support him or not, he is our President and I was proud to have the opportunity to see a President of the United States in real life!